The fourth edition of the March Project residency exhibition kicked off on September 30 at Sharjah Art Foundation’s artspaces — heritage houses and public squares, including Al Mureijah Square, Calligraphy Square and Arts Square. The March Project is an annual educational residency programme that provides opportunities for artists to research, realise and present site-specific works through a series of professional development courses, seminars, exhibitions and site visits over a five-month period. Participants in this programme are chosen from the Gulf and abroad. Artists are assigned mentors who work closely with them as they develop their exhibition projects. The exhibition, curated by Reem Shadid, Deputy Director of Sharjah Art Foundation, features commissioned works developed by four resident artists under the mentorship of Clelia Coussonnet, Lara Khaldi and Sophie Arni. This year’s participants are Al Anood Al Obaidly and Nasir Nasrallah from the United Arab Emirates, Mahmoud Safadi from Lebanon and Sofiane Zouggar from Algeria. “The final selection reflects a group of artists who are trying to expand and explore various themes, forms or aesthetics, thereby pushing their practice into new directions,” Shadid tells Weekend Review. “It is really amazing that two Emirati young artists were selected, that makes it even more interesting that they get exposure not only locally but also regionally,” says Giuseppe Moscatello, Director Maraya Art Centre-1971 Design Space. “It is also amazing that most of these projects relate to the surroundings, and through these practices, tell stories about the local history, but it can be also understood from an international angle,” he says. “The fact that each project is distributed in different areas, makes you explore the Heart of Sharjah, and understand more about the incredible history you can find in the neighbourhoods,” Moscatello adds. The works this year reflect the artists’ exploration of Sharjah’s contemporary histories as well as questions of production and consumption. The urban environment and its intersection with the natural world is the focus of Beirut-based multidisciplinary artist and filmmaker Mahmoud Safadi. He uses these skills to great effect in his installation titled An Ecology, comprising three works. In the second work, Of Flesh and Earth, a series of clay and gypsum sculptures, human limbs are shown as if frozen in gestures while in the process of working and manipulating the earth. While we actively promote green spaces, the immense labour and care that goes into sustaining greenery in urban environments are often forgotten. 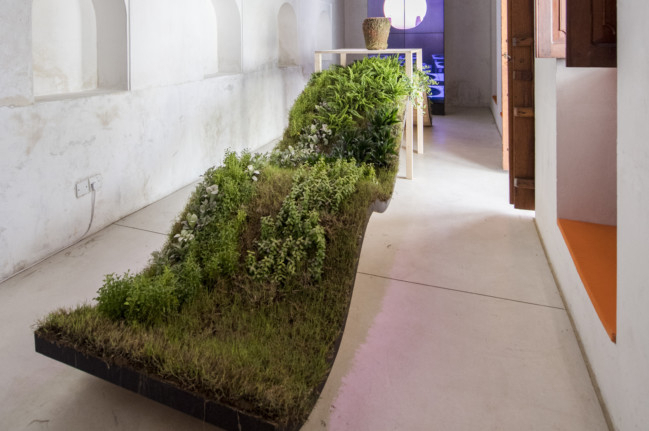 Living Byproduct is an installation that calls attention to the foliage found in the hidden spaces of cities — a byproduct of air-conditioning. The water condensation provides the right conditions for local weeds to sprout and thrive from the tiled or concrete floors. This work positions us as urban actors whose understanding of designated green spaces are constantly challenged. Abu Dhabi-based Al Anood Al Obaidly is a Visual Arts graduate from Zayed University, whose collages are derived from various consumer materials. Al Obaidly has participated in many group shows in the UAE. In Slightly Related Elements, Al Obaidly explores the relationship between everyday objects and humans and the “experience of renewal” when confronted by the familiar in new or unfamiliar forms and contexts. The sculptures comprising Slightly Related Elements are constructed from a variety of found consumer materials — paper, metal, sponge, plastic, plaster, paint, wood, fabric, rope, tape and cardboard — which have been reassembled and/or reproduced. It becomes a thorough but playful investigation of colour, shape, form and composition as well as balance, tension, and control. The process through which certain objects come to attain subject stratus is questioned as well as the conception that humans are only actors defined by their relationship to everyday objects. For the artist, the forms and materials are dependent on a particular point of personal experience. There is also an effort to conceal an obsessive documentation of everyday objects, and introduce a playful element into the final work. For the viewer, on the other hand, it offers the setting for a personal journey across time, memory and sensory enchantment. Algeria-based Sofiane Zouggar’s work Temporary Flesh Walls Stories, Permanent Posters And One Portrait, focuses on the relationship between the human condition and information. The mixed media work encompassing photography, lightboxes and formwork installation takes us into the world of Izhar, the elderly Pakistani expatriate caretaker of the abandoned and derelict Khorfakkan Cinema. 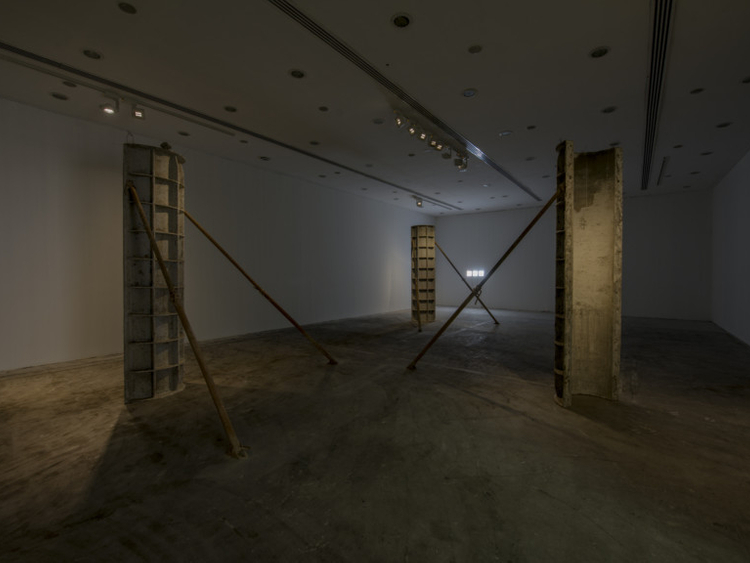 Izhar has been living in Sharjah for more than four decades and Zouggar’s installation takes us into this world, where the subject shares his history and invites us into his space, both at home and at the cinema that spur reflections about migration, alienation and loss. In the dimly lit but huge space, the three scaffoldings with its exposed concrete like surfaces, along with the three small lightboxes does the job superbly. Zouggar evokes Izhar’s past as a building worker who was involved in the construction of the cinema. He then becomes the projectionist and then its caretaker — a phantom within its walls. It is also an indirect reference to the transitions in the life of an expatriate worker and the professional roles he/she has to manage. The derelict cinema hall with the rows of dusty seating intact, Izhar’s once modest accommodation and possessions are evoked effectively. Izhar’s portrait itself shows a gentle, large person in what was once the projection room — the heart of the cinema. It is a scene of quite reflection. The drama of construction, activity and abandonment of a place or a structure, the lives that revolved around it — all these raise poignant questions for which there are no easy answers. Zouggar’s work makes connections with UAE photographer Ammar Al Attar’s installation at last year’s March Project on the same subject, documenting the Khorfakkan Cinema and its history, which was once a part of Sharjah’s cultural life. Art lovers can in the future can very well look forward to driving to Khorfakkan, when Sharjah Art Foundation restores the once thriving Khorfakkan Cinema into their expanding network of artspaces. Sharjah-based artist and curator Nasir Nasrallah is a communication engineer by training and in this installation work using letters, the typewriter and landline telephones, focuses on the philosophy of communication and correspondence. In The Communication Room, Nasrallah tests new concepts and methodologies as he addresses the different systems used in communicating information and their profound impact on their surroundings. His works revive some of the communication methods used in the past. Utilising communication methods of the past, The Communication Room is an installation composed of four artworks, Mailing System Rearrangement, Everyone Is The Author Here, ‘06- 544 7575’ and Never To Be Opened. The works explore how modes of communication connect disparate places and times, even though individuals may be physically separated by great distances. For Nasrallah, the capacity to bridge great intervals of time and place through modes of communication is integral to exploring notions of existence and matter. While addressing various communication systems and their impact on their surroundings, Nasrallah’s project examines how these systems can ultimately create new stories and imaginary worlds that circumvent conventional understanding of space and time. For Mailing System Rearrangement, 225 self-addressed envelopes on which Nasrallah illustrated a variety of sketches were posted in red letter mailboxes in various locations of Sharjah. He then organised the envelopes into a mural, according to the order in which he received each one. A new but random order is created by a system beyond the artist’s control, revealing the influence of space and time on the illustrated envelopes and creating a new and unique composition that exudes a kind of mystery. Everyone Is The Author Here invites each visitor to participate by contributing to the authorship of one story. There are two typewriters — for Arabic and English respectively, with paper already loaded. All one has to do is read the preceding sentences and attempt to create a narrative and carry forward the earlier thought out of your own imagination. Being a typewritten manuscript, the anonymity of the unknown writers is maintained, but at the same one can forge links between strangers. Randomness and participation is the hallmark of ‘06- 544 7575’ too, comprised of a telephone locked inside a wooden box with only the handset accessible to viewers. The work’s title reflects the telephone’s number, which the artist has shared over social media and other communication channels in order to reach a wide public. People are encouraged to call the number and talk to strangers who happen to pick up the phone ringing in the exhibition space. Never To Be Opened presents two sealed and framed envelopes. One to be opened in the past, and the other to be opened in the future. However, since we can neither revisit the past nor transport ourselves into the future, neither envelope can be opened. In our present, the past and the future remain out of reach. This work is a poser on “the dream and impossibility of time travel”. It could also be a gentle reminder by Nasrallah for us to be more mindful of our present! Can you tell us the selection process for the March Project? One of the goals of this educational residency programme is to encourage opportunities, conversations and collaborations between artists working in the UAE and the region. The selection process happens through extensive research into the practices of local and regional practicing artists, principally those working with various media, including video, sculpture, painting, multimedia installations, mixed media and more. The final selection reflects a group of artists who are trying to expand and explore various themes, forms or aesthetics, thereby pushing their practice into new directions. In your view, how does these four artists’ work tie in with the larger themes of this year’s Biennial? The March Project is an annual education residency programme at SAF that bears no relation to the Sharjah Biennial nor necessarily its theme. However, they do have access to SAF’s experienced technicians and body of research that has been developed over many biennials and SAF’s year-round programme of activities. How long did the artists take to realise their artworks? After the conclusion of selection process, the artists are invited to Sharjah in March to conduct a residency and research. In June, the artists submit their proposals to me for review and discussion. The works are then realised within a time frame that is based on their individual proposals. Each artist spends time in Sharjah, with SAF and with communities in the Emirate, which ultimately shapes their projects. The exhibition falls sometime between September and November. On the whole, the process from selection to exhibition takes around 10 months. What were the roles of the three mentors? The mentors are expected to provide support to the artists. The artists can establish the relationship they wish to have with their appointed mentors. Some mentors work very closely with their artists on developing proposals. Others aid in research and provide theoretical readings, while others act as discussants, and facilitate conversations to help the artists delve deeper into their topic of interest. It is a case-by-case situation, and it all depends on the artists themselves and how involved they want their mentors to be in the entirety of the process. What are your impressions/remarks regarding the final March Project 2017 artworks, and what were the responses from critics and other viewers when the show opened? We at SAF were pleased with the artist’s final projects. The artists were able to push the boundaries of their work in terms of scale and complexity, and the public responded positively to the show. Many people from the UAE’s arts community were present for the opening. The UAE and region’s arts communities have been highly supportive of artists early in their careers, and The March Project is an extension of this support. 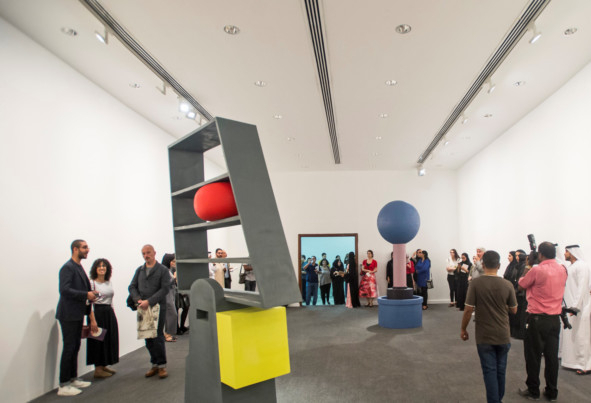 It is instrumental in not only identifying artists but also promoting their practice, and the value of contemporary art, within the cultural landscape of the UAE and the greater region as a whole. N.P. Krishna Kumar is a writer based in Dubai. The works of this year’s March Project will be on view until December 30, 2017, across SAF’s spaces in Al Mureijah square, Calligraphy square and arts square.